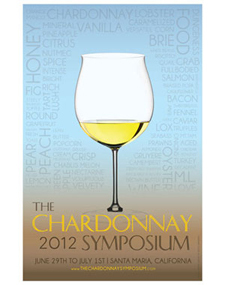 Santa Maria, California – June 29-July 1, 2012, Chardonnay, the world’s beloved noble white grape, is once again being celebrated at The Chardonnay Symposium in the Santa Maria Valley appellation of Santa Barbara County. 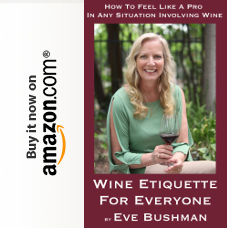 Internationally recognized producers, new-comers to the craft and pioneering growers will gather in this leading Central Coast appellation to analyze, discuss, and, ultimately, celebrate this versatile, oftentimes profound varietal. As Chardonnay marks its 100th birthday of growth in the United States, The Chardonnay Symposium remains the only event of its kind devoted solely to the exploration of Chardonnay. With an educational panel session moderated by the Wine Enthusiast’s Senior West Coast Editor and popular Blogger, Steve Heimoff, a gourmet food pavilion, chef-guided wine and food pairings, satellite winemaker dinners, and a grand tasting featuring over 50 producers, the 2012 Chardonnay Symposium promises to be yet another illuminating, thought-provoking and fun celebration of the world’s most celebrated golden grape. June 30, Saturday’s premier, full-day event begins at Byron Vineyard and Winery with Wine Enthusiast’s Steve Heimoff headlining a distinguished panel of speakers to explore “Chardonnay and Terroir: What’s it all about?” Joining Heimoff for the discussion are eight winemakers, all of whom craft Chardonnay in California, from regions ranging from Santa Maria to Napa. 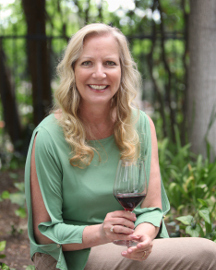 Panelists include 2011 Wine Enthusiast Winemaker of the Year, Bob Cabral of Williams Selyem, Jenne Lee Bonaccorsi of Bonaccorsi Wine Company, Dieter Cronje of Presqu’ile Winery, James Hall of Patz & Hall, Eric Johnson of Talley Vineyards, Heidi von der Mehden of Arrowood Vineyards & Winery, Foxen Winery’s Bill Wathan and Graham Weerts of Stonestreet in Alexander Valley. Directly following the panel session, The Grand Chardonnay Tasting takes place from 12:00 to 4:00 pm, also at Byron. 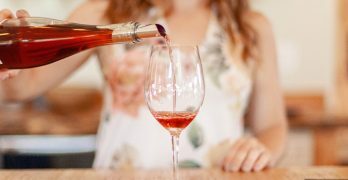 This expanded tasting will afford guests the opportunity to sample a variety of Chardonnays from over 50 wineries, along with foods that pair well with Chardonnay. Celebrity chefs, including Budi Kazali of The Ballard Inn, Alfonso Curti of Trattoria Uliveto and Ryan Gromfin of Central City Market will reveal Chardonnay food pairing secrets under the demonstration tent. Additional winery and culinary events round out a full weekend of Chardonnay celebration in the Santa Maria Valley beginning with the BYOC BBQ at the historic Sierra Madre Vineyard on Friday, June 29, from 6:00-9:30 pm. Guests are invited to bring their own bottle of Chardonnay to share while enjoying a gourmet barbecue, music, dancing, wine tasting and Santa Maria style hospitality at their beautiful Vineyard Room. The weekend will culminate with a “Pops in the Vineyard” concert by the Santa Maria Philharmonic Society on Sunday, July 1 at 2:30 pm at Tres Hermanas Vineyard & Winery. Saturday winemaker dinners and Sunday tasting room events will be announced soon at www.thechardonnaysymposium.com. To purchase tickets or get more information, including a detailed event schedule, visit www.thechardonnaysymposium.com or email info@thechardonnaysymposium.com.